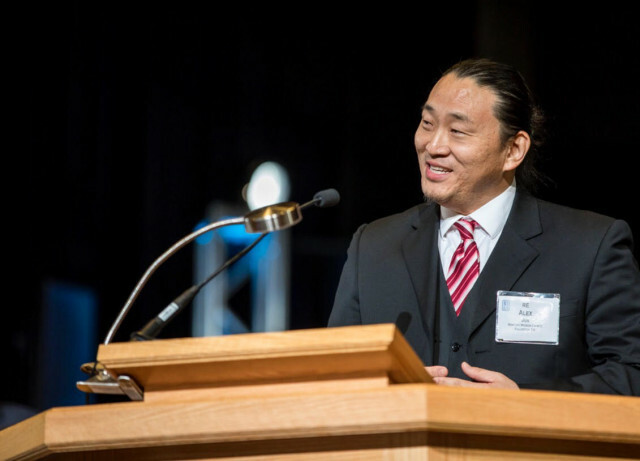 Alexander Jun, Ph.D., professor in Azusa Pacific University’s Department of Higher Education, has been elected moderator of the 45th General Assembly of the Presbyterian Church in America (PCA), the highest court in the denomination. Jun, the first Asian American elected to this position, took the gavel and led the assembly on June 15-17, 2017, guiding pastors and church elders through resolution propositions, which initiate and regulate church policies and practices. The largest annual gathering of the denomination, the PCA General Assembly invites church leaders from across the country to discuss and vote on matters including theological issues, ecclesial business, and outreach ministries. At APU, Jun teaches courses from a Christian perspective on diversity, accessibility, social justice in higher education, comparative higher education, and qualitative research methods. Jun brings his scholarship and teaching experience to his position at the assembly. While earning his Ph.D. in Education Administration at the University of Southern California, Jun received a Ford Foundation fellowship to conduct research on college preparation programs for urban youth. Jun has published extensively on issues of postsecondary access for historically underrepresented students in underserved areas and on globalization in Pacific Rim universities. He recently completed a three-year narrative inquiry research project on the educational mobility and academic resilience of Khmer orphans, the basis of his TEDx talk entitled, “Bloom Where You Are Planted: Lessons Learned from Orphan Scholars.” He is the coauthor of White Out: Understanding White Privilege and Dominance in the Modern Age, which addresses racial divides in college campuses and institutions across the country. Alexander Jun, Ph.D., serving as moderator of the 45th General Assembly.